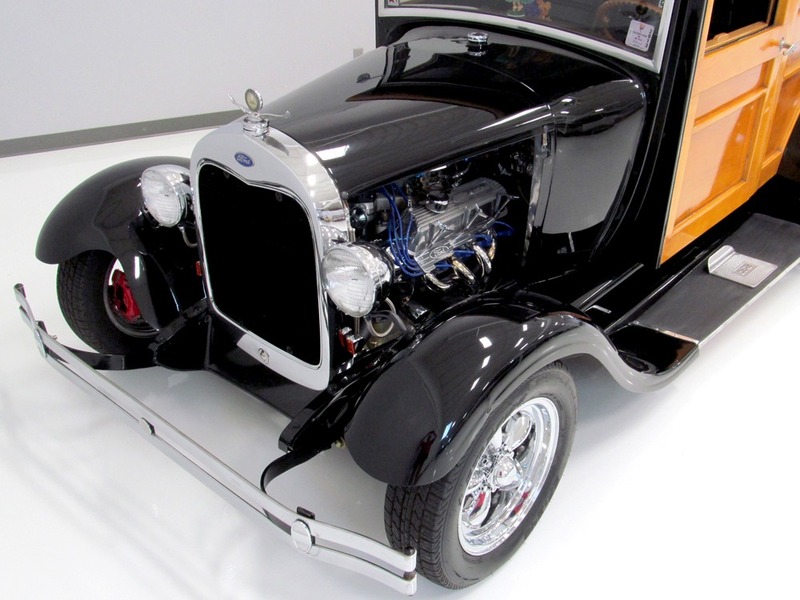 A very unusual and downright fast little Ford that has an awesome look and just wants to have fun. 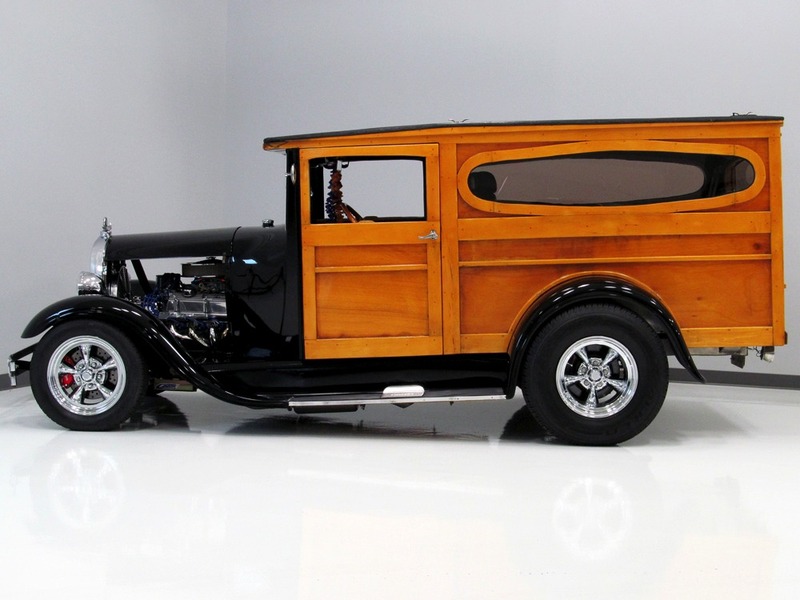 For a lot of guys, the glory days of hot-rodding were when you still had to actually build a car, not order it from a catalog. 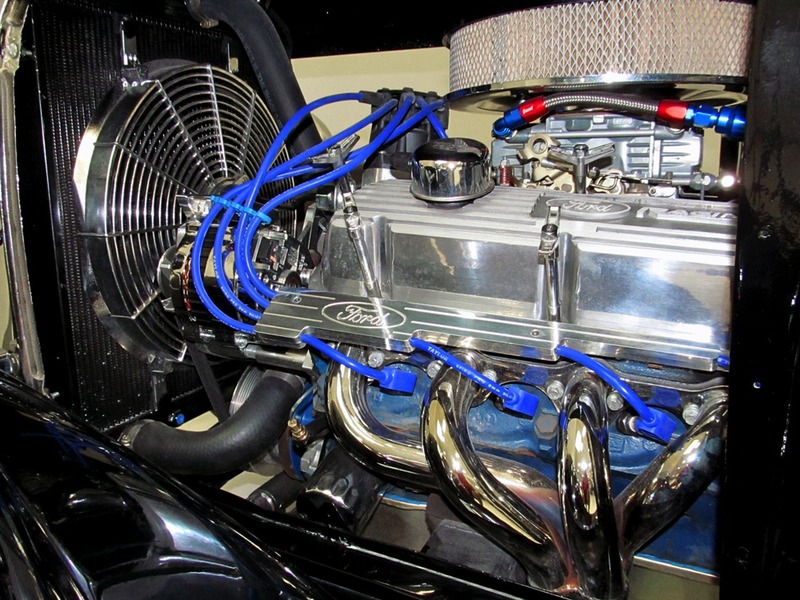 Throughout the 1960s, as performance from the OEMs exploded, so did the performance of the hot rods, and the results were some outrageous creations that carry a lot of nostalgic appeal today. 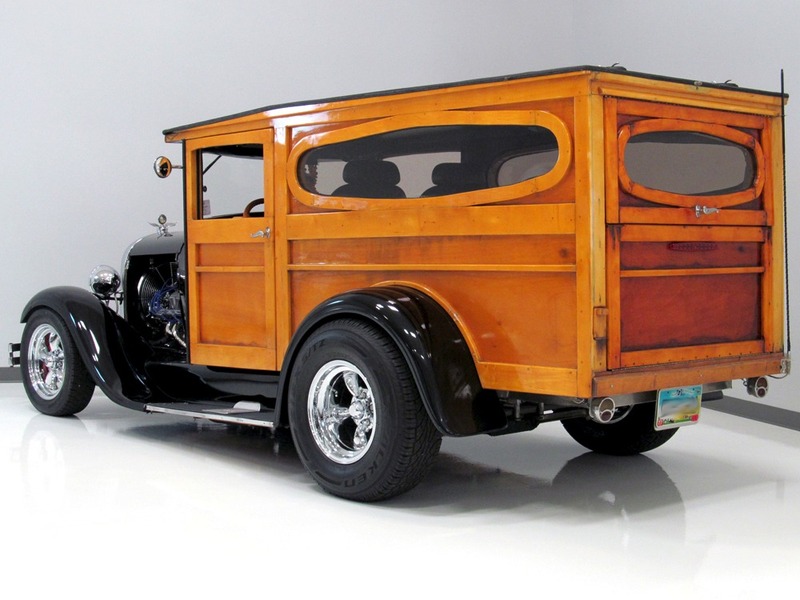 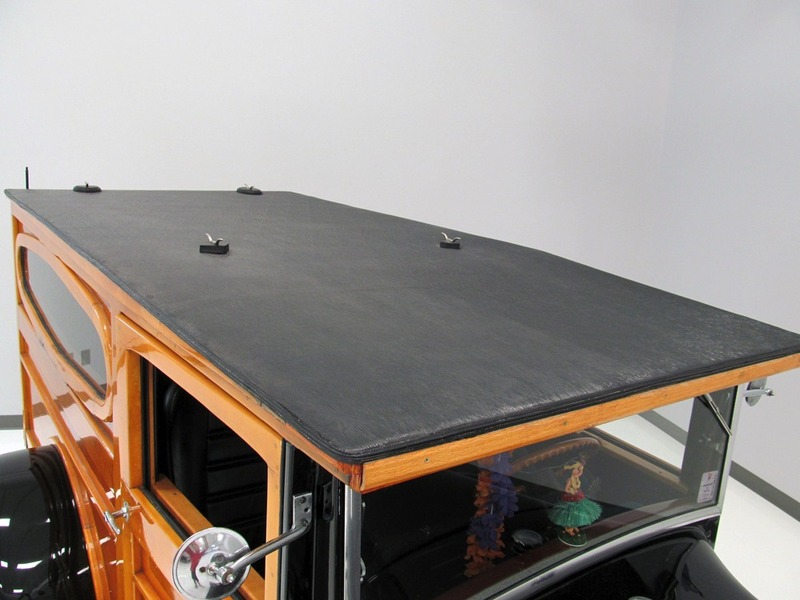 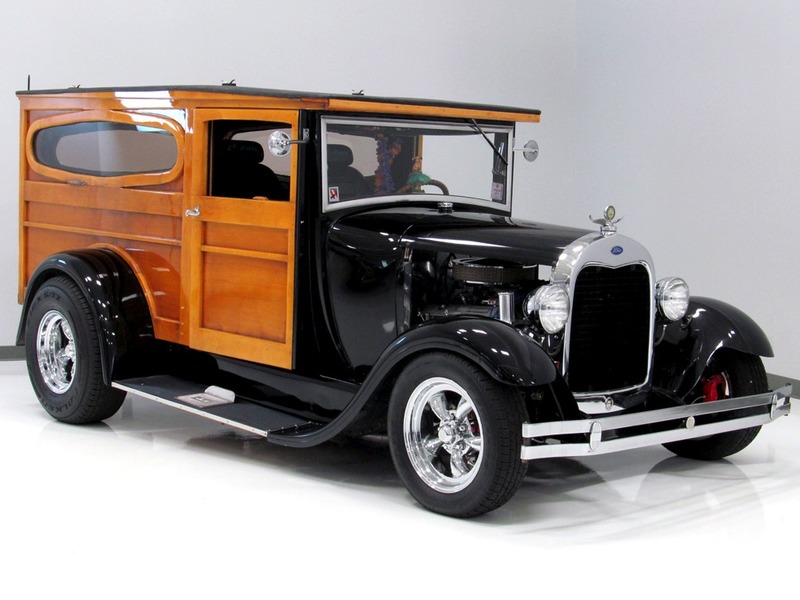 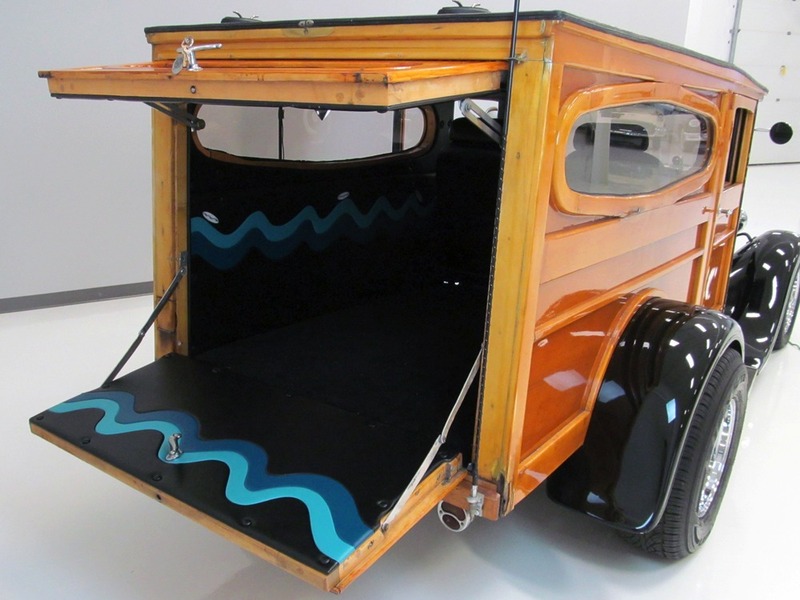 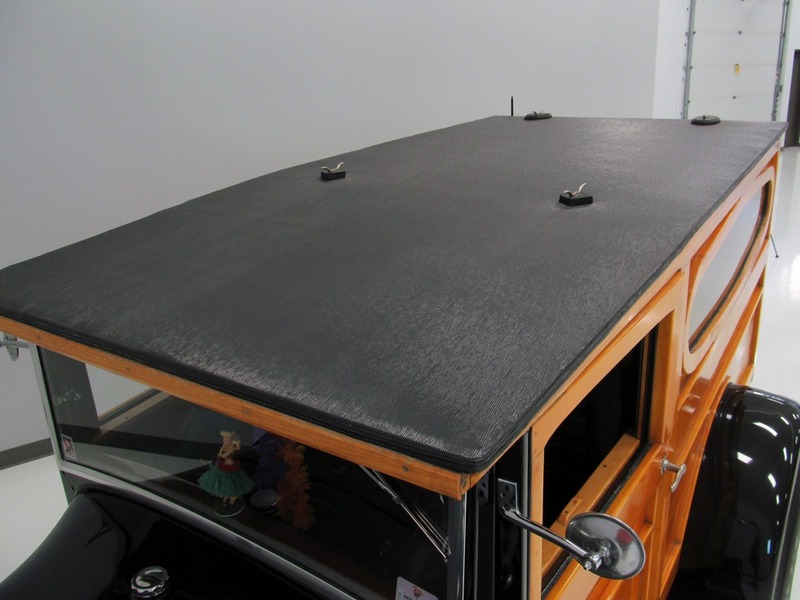 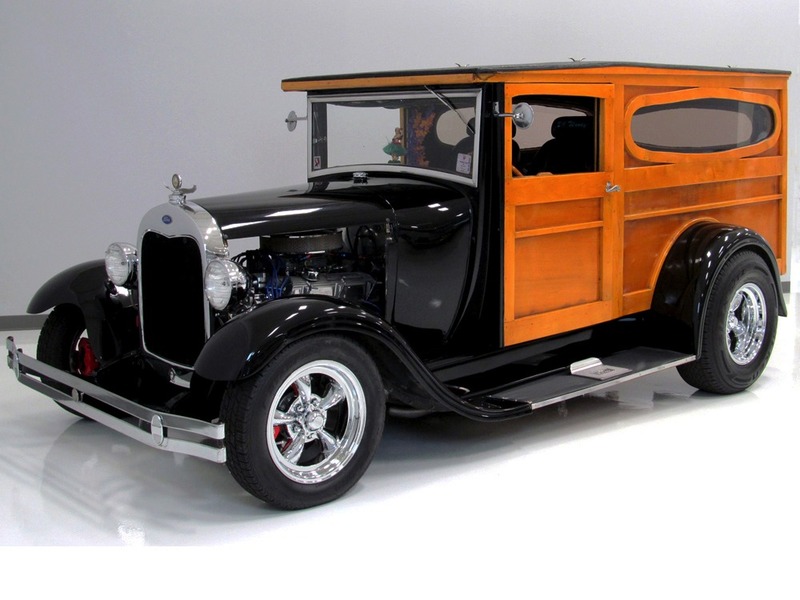 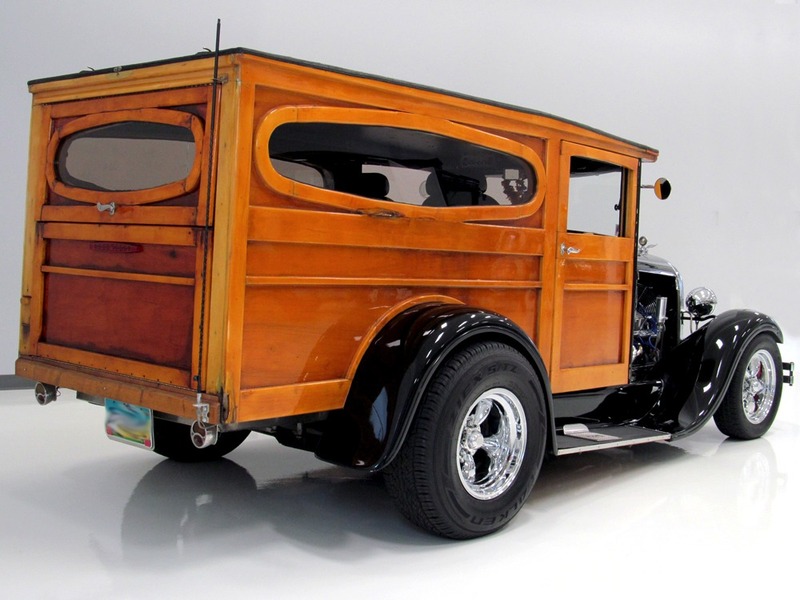 This 1929 Ford woody panel delivery was probably originally built in the late 1960s or early 1970s, so it has that old-school vibe (pretty easy to imagine this car on the cover of a Beach Boys album, no? 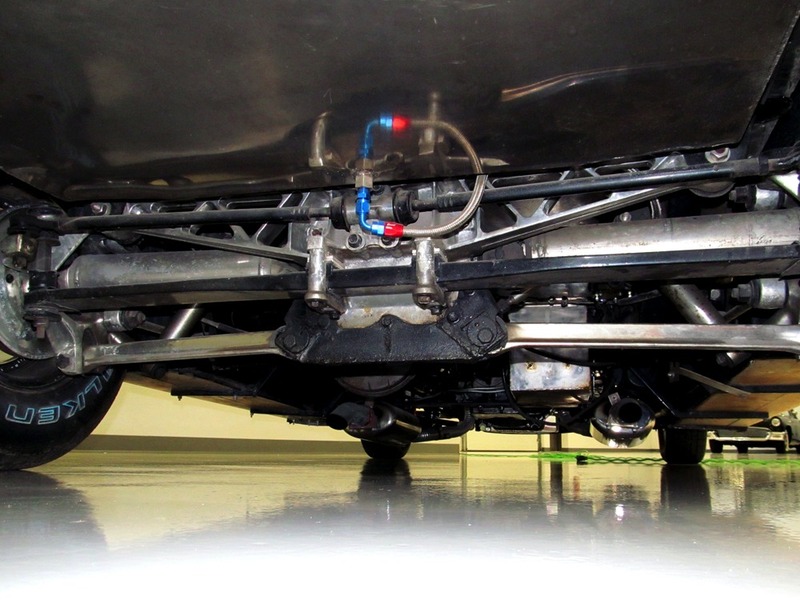 ), but thanks to a more recent and comprehensive rebuild, it has thoroughly updated mechanicals underneath. 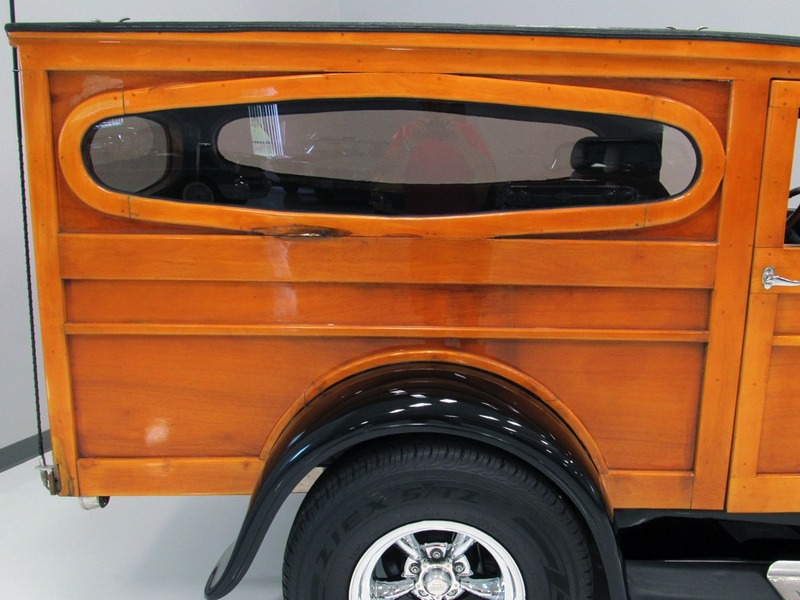 The result is a rod that attracts a ton of attention everywhere it goes and is a fast, fun, capable, and surprisingly practical surf wagon that puts a smile on everyone’s face. 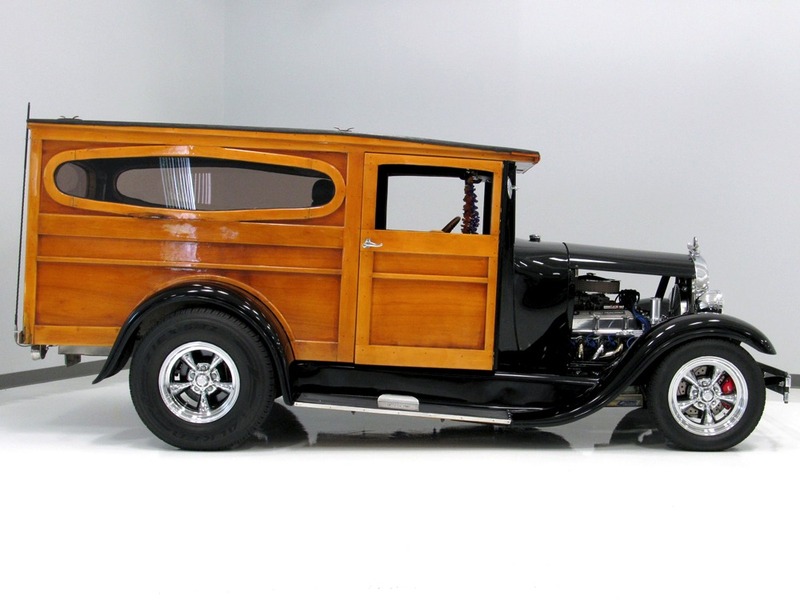 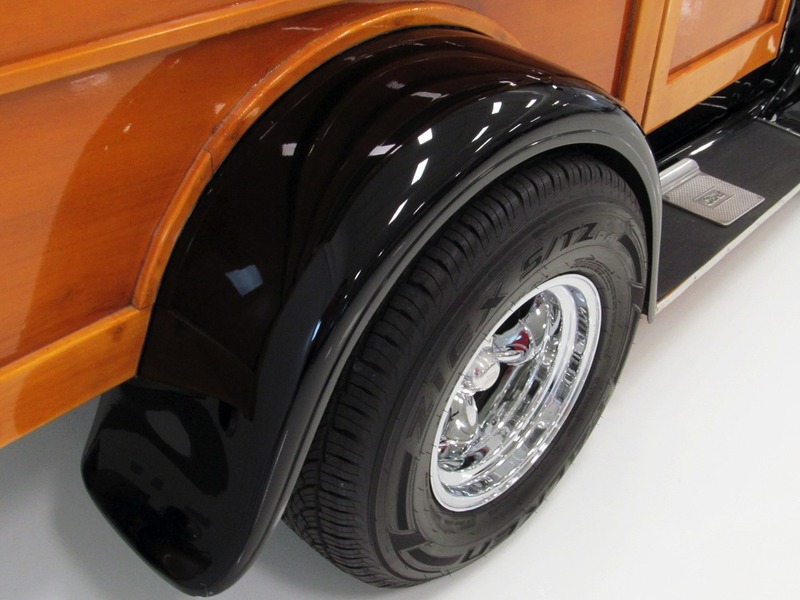 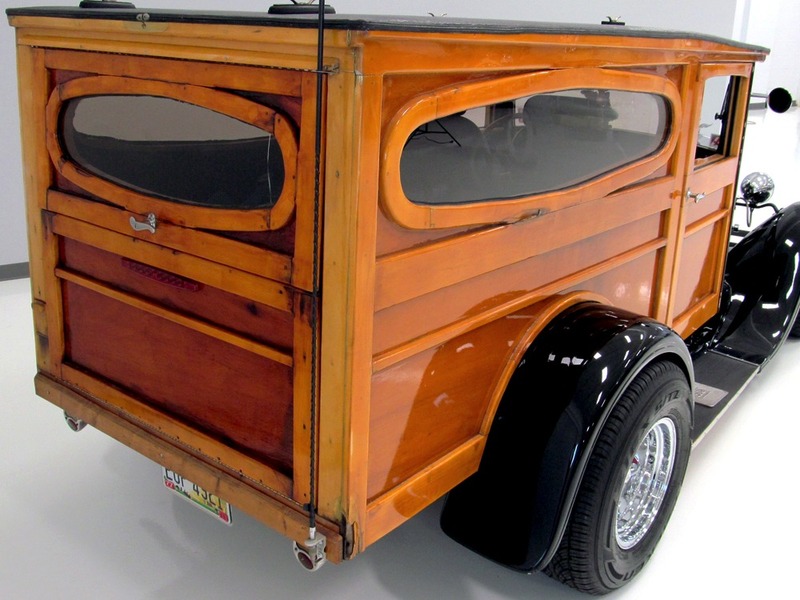 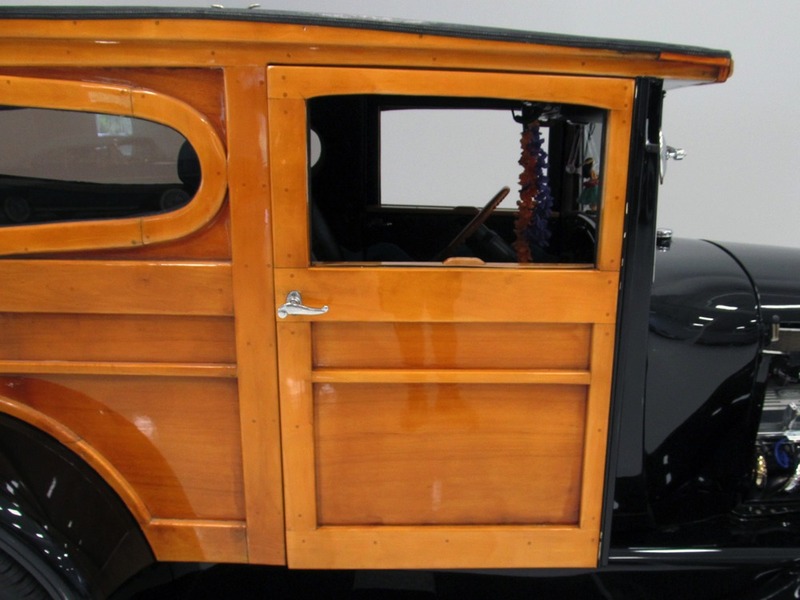 As far as we can determine, this was an original 1929 woody wagon when construction started. 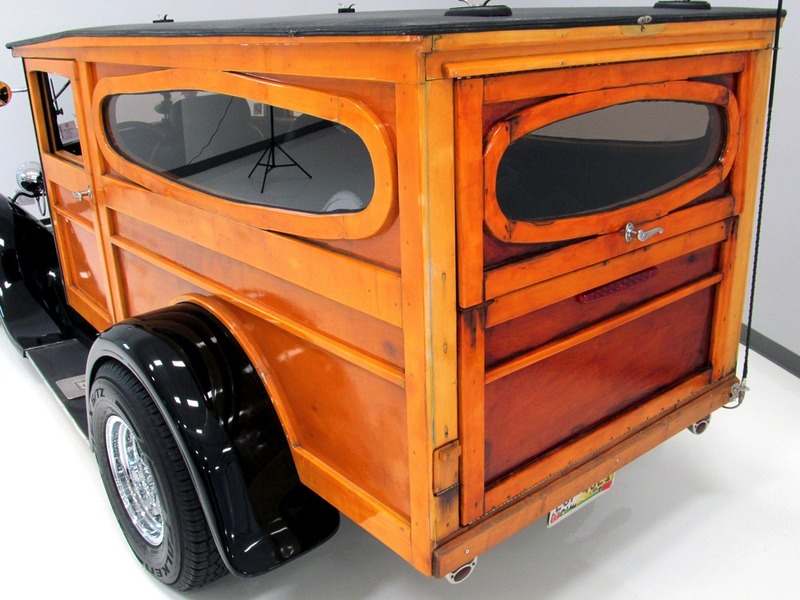 Things like the cowl, windshield, door hinges, and hardware all look like factory-issue, although the wood has obviously been re-created to make a totally unique machine. 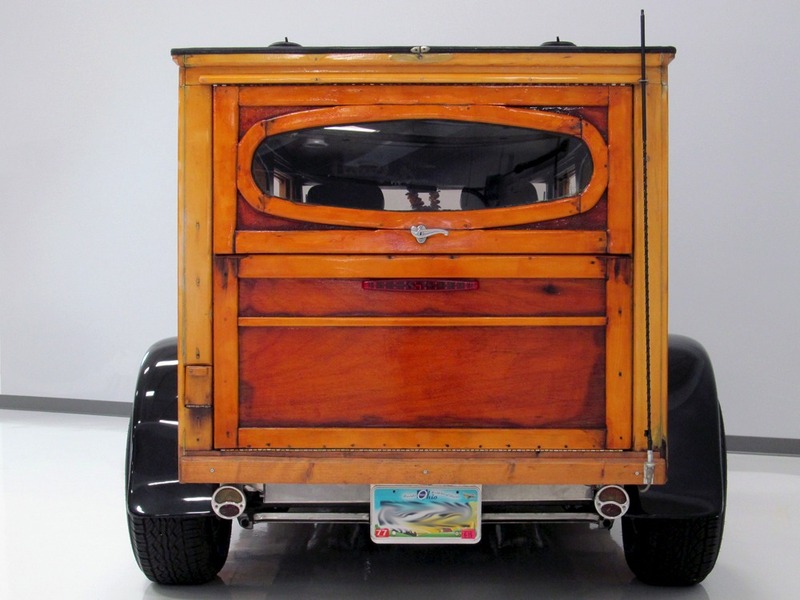 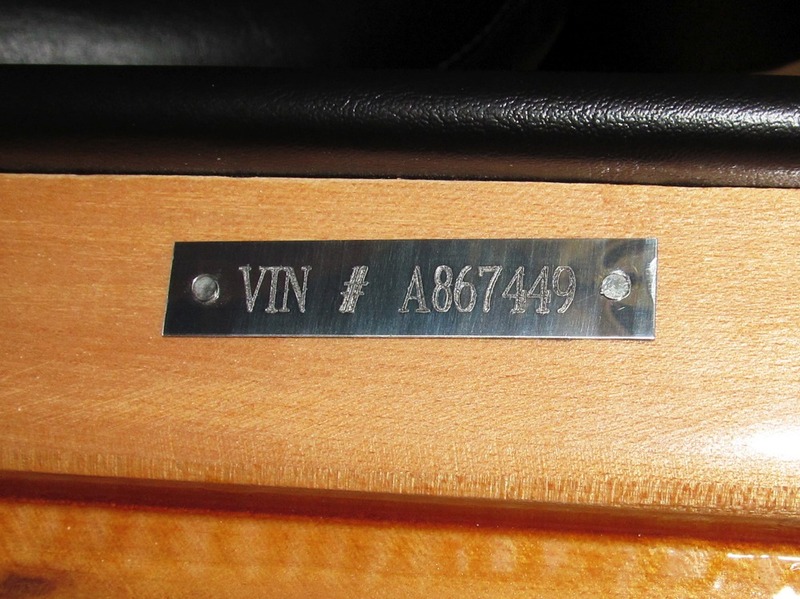 The wood is likely decades old, so it has an awesome bit of patina that is a big part of a woody’s appeal, but none of it is deteriorated or damaged, so no worries about deferred maintenance (which was why the woodies died out in the first place). 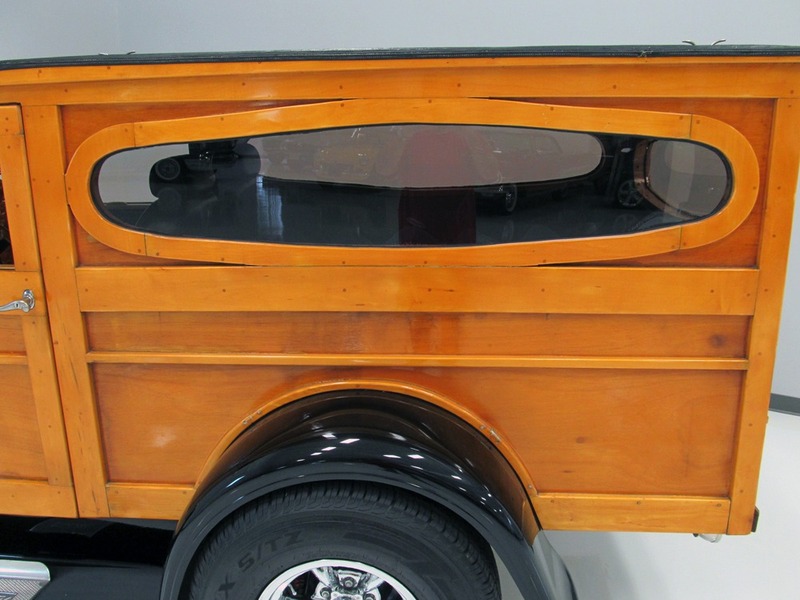 Some of the wood actually looks original, perhaps parts of the tailgate assembly, which are slightly darker and older-looking than the rest of the body. 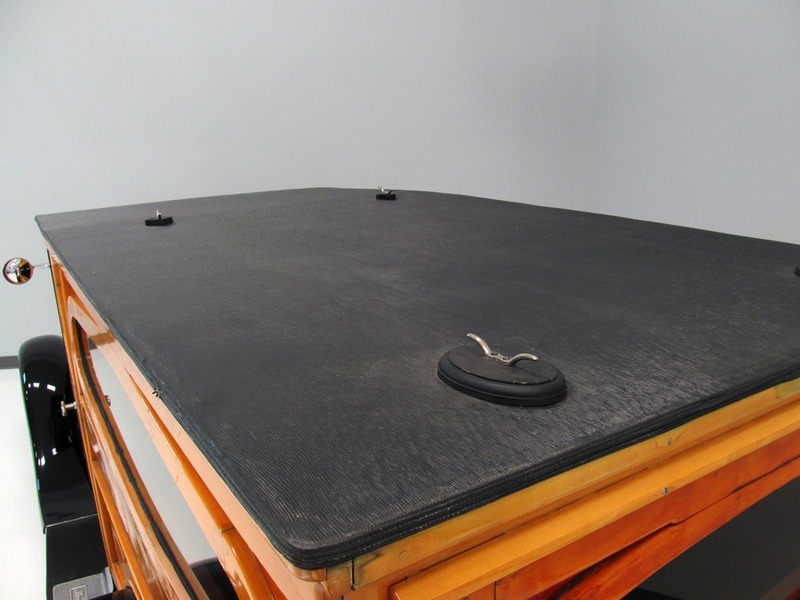 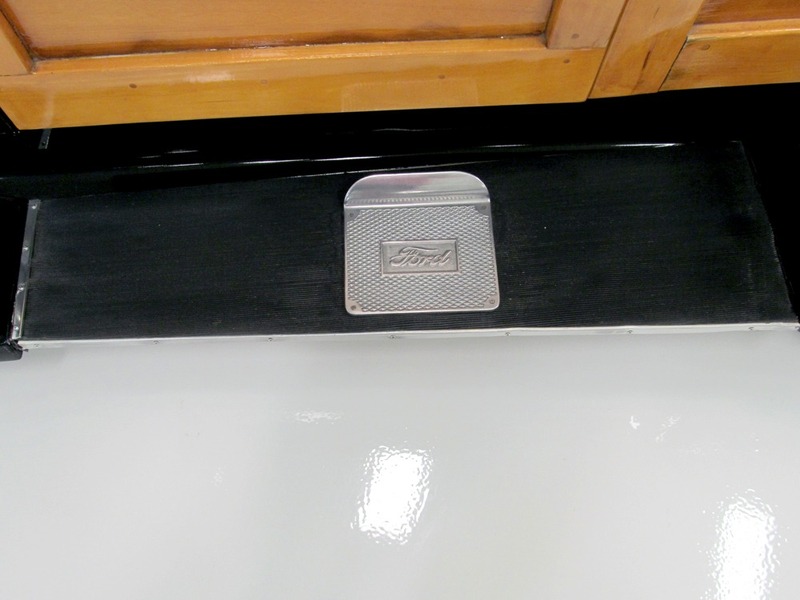 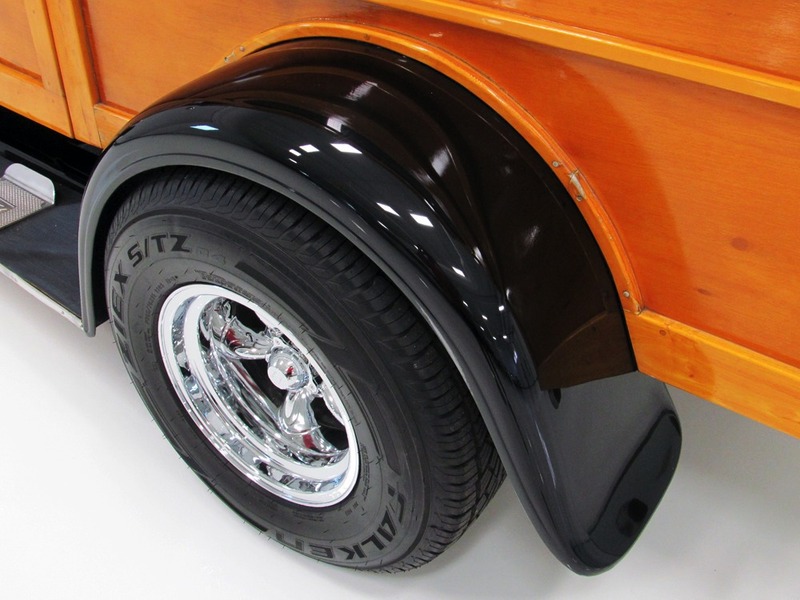 More recently, it was comprehensively rebuilt by the owner of a high-quality body shop, and he likes black, so every painted surface on the car was reworked and smoothed to be worthy of the beautifully two-stage black paint that looks deep enough to swim in. 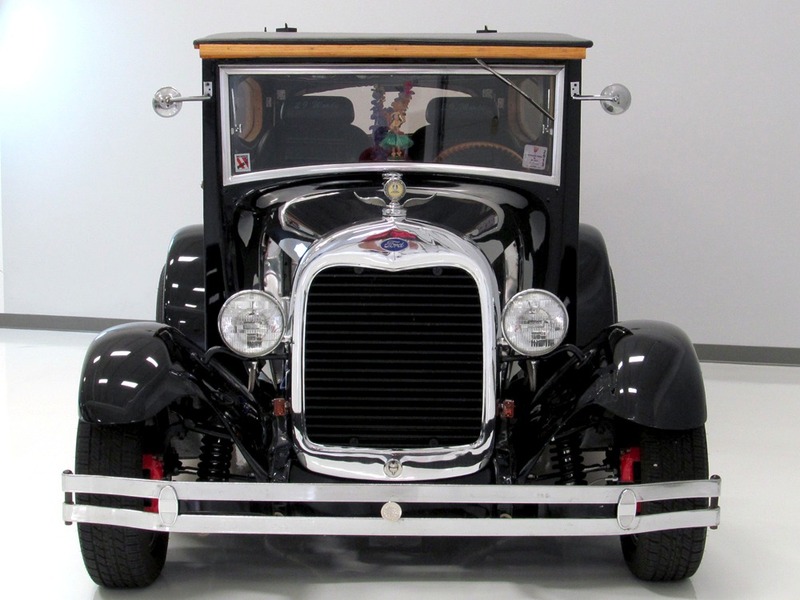 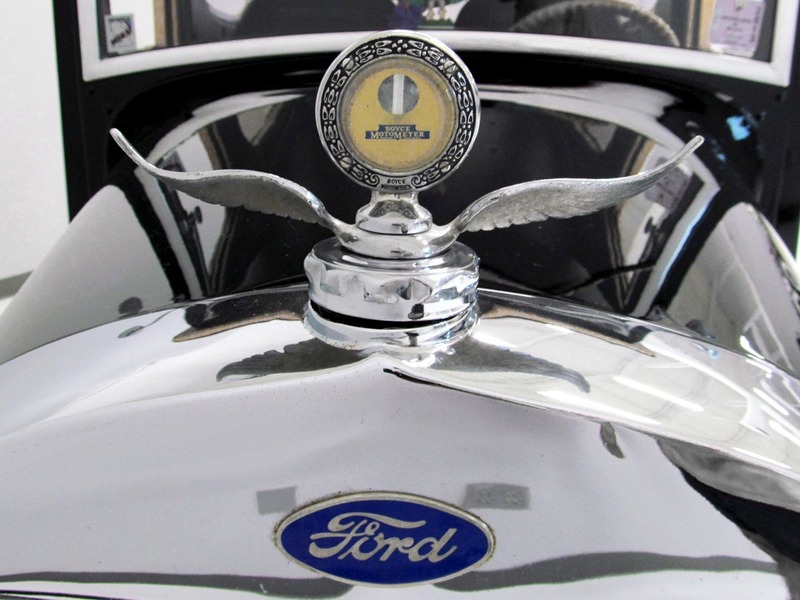 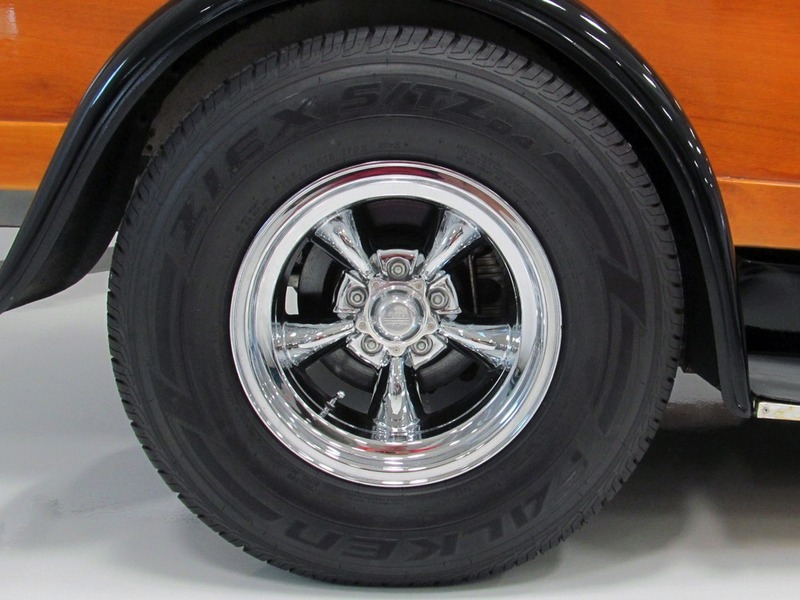 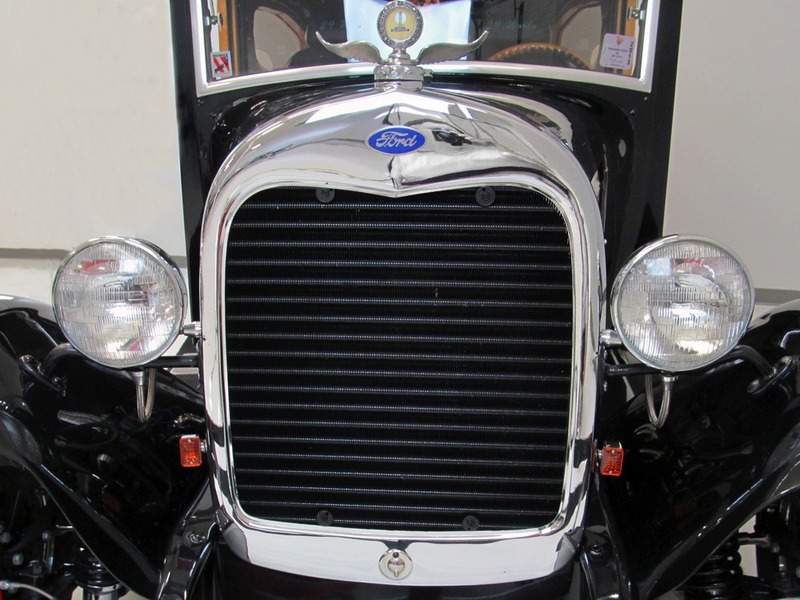 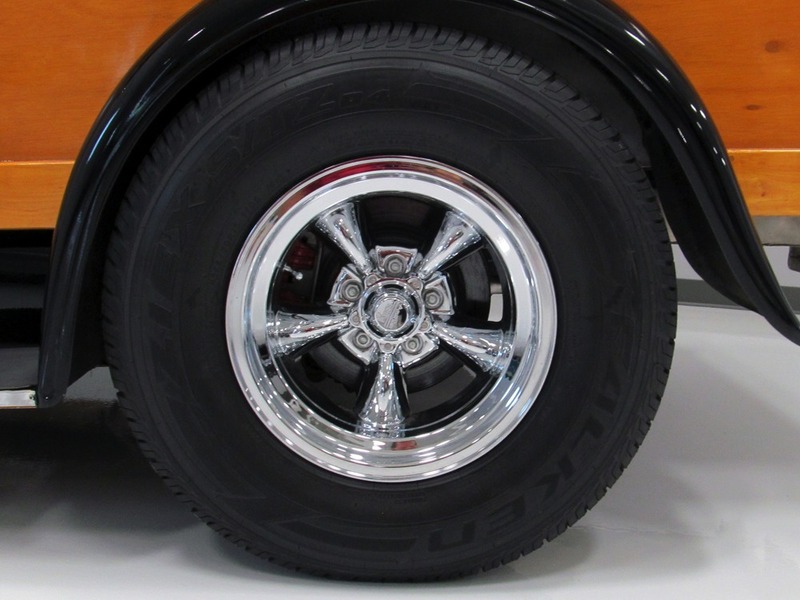 The fenders and half hood are ‘glass, while the cowl is Henry Ford steel, but none of that is apparent to the eye and it looks very trick sitting on the show field. 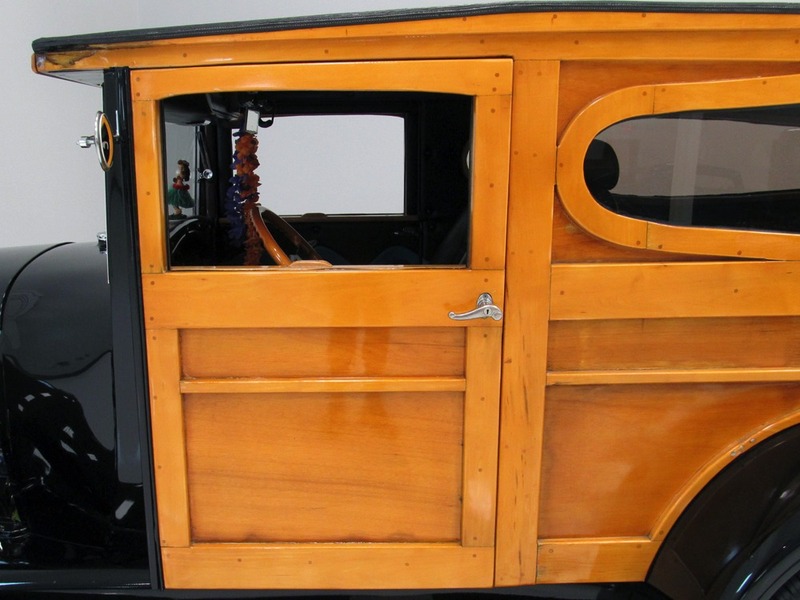 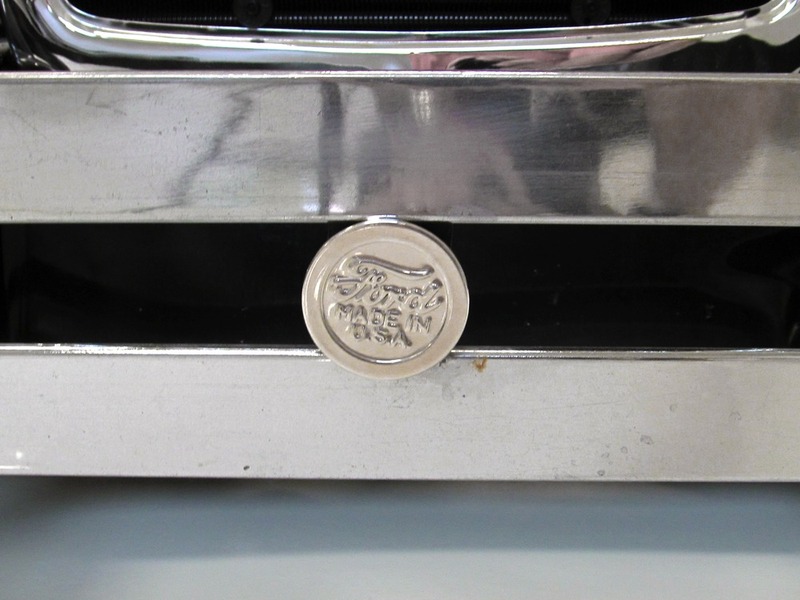 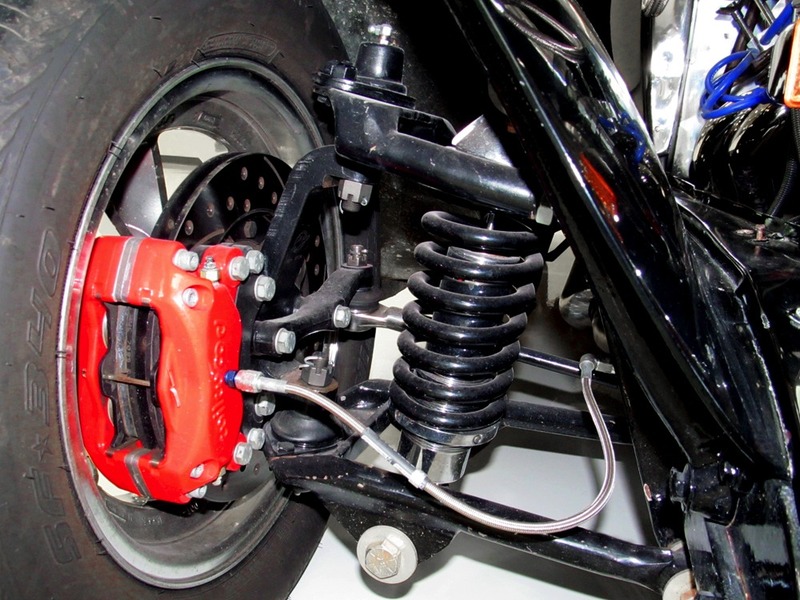 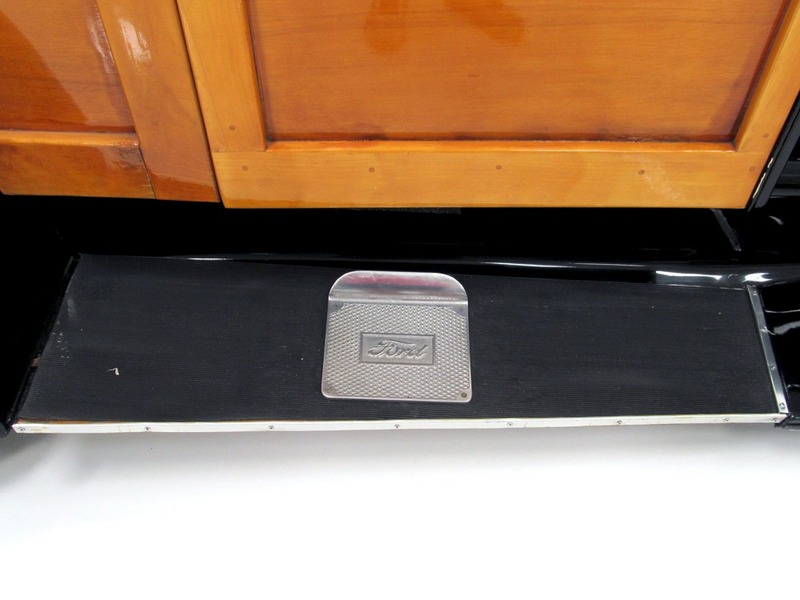 Original details like the radiator shell (with functioning Boyce Moto-Meter), two-tier bumpers, and aluminum step plates on the running boards give it a very authentic look. 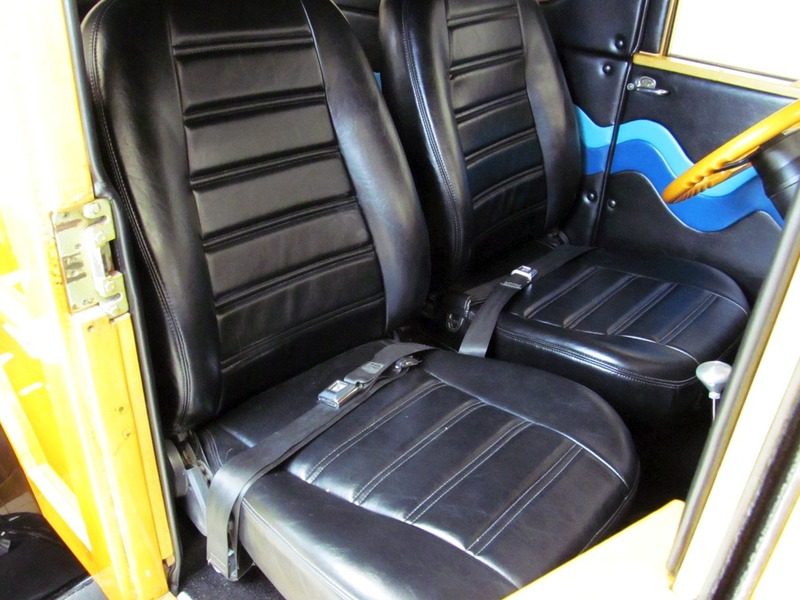 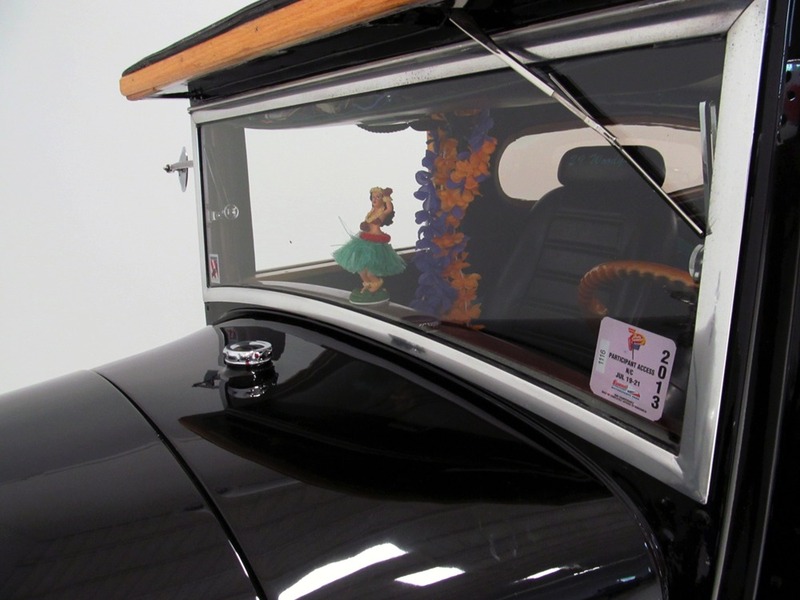 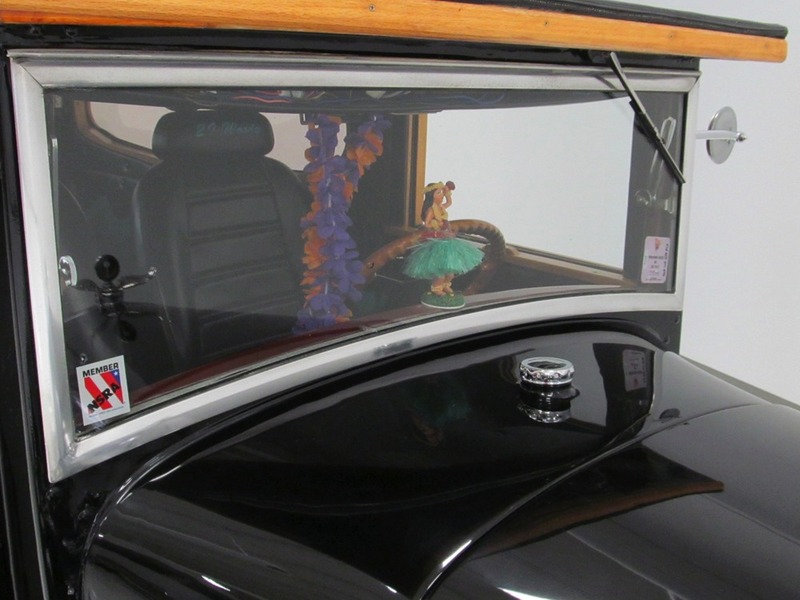 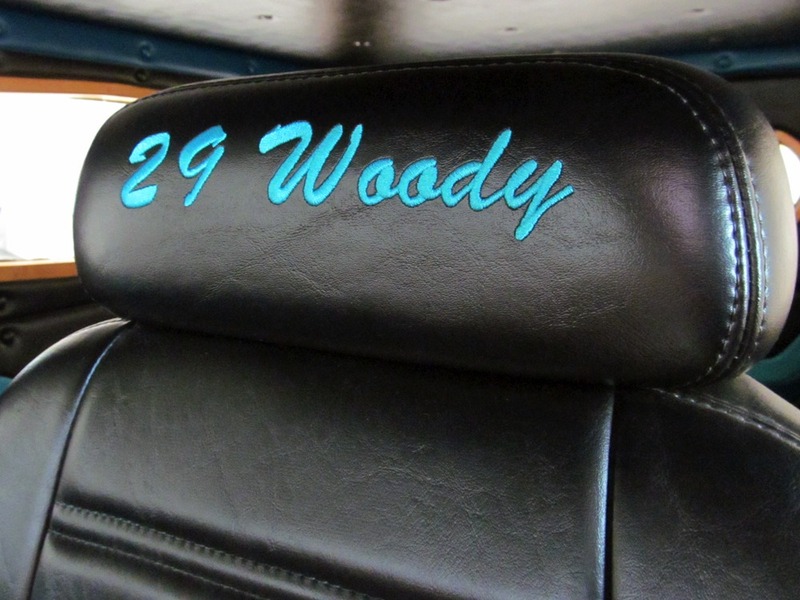 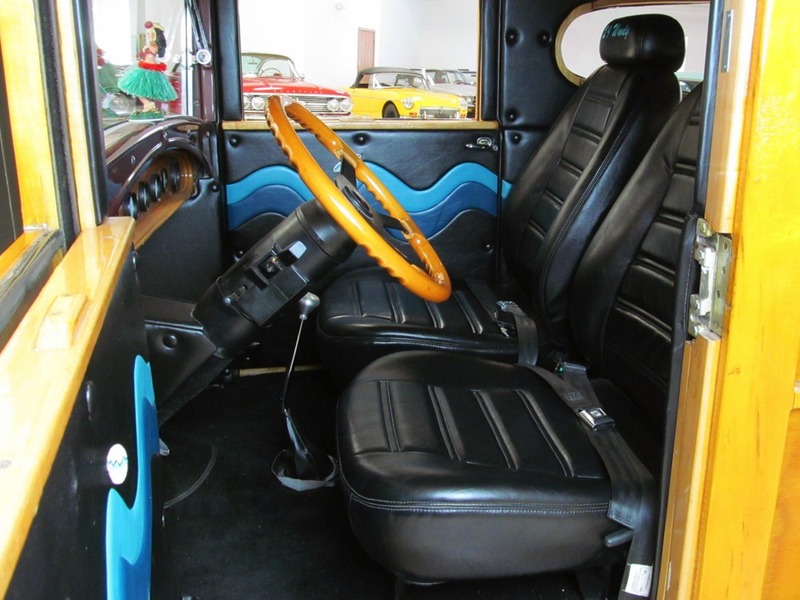 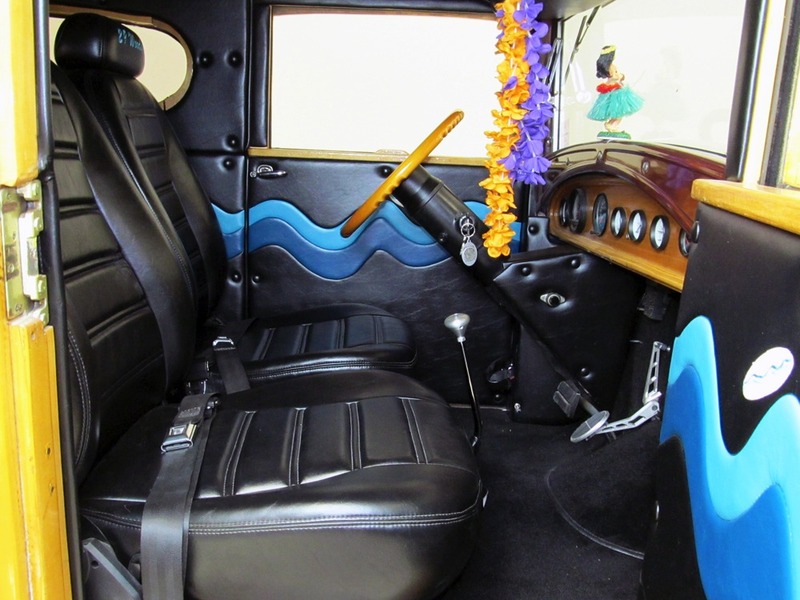 The interior is fun for two and carries a surfing theme that works quite well with the woody’s sunny attitude. 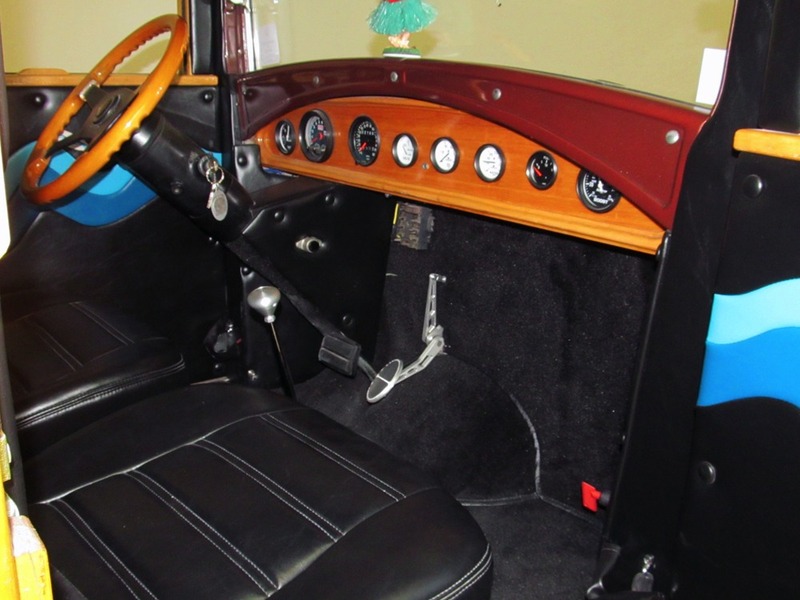 Newer black bucket seats with custom embroidery on the head rests provide good support for cruising and bolstering that’s useful given that this little Ford is pretty good in the corners (more on the trick suspension in a moment). 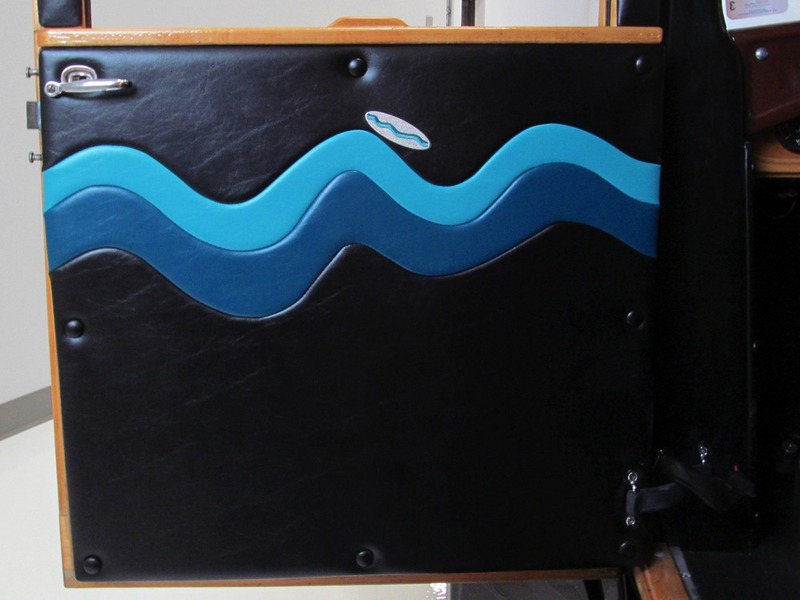 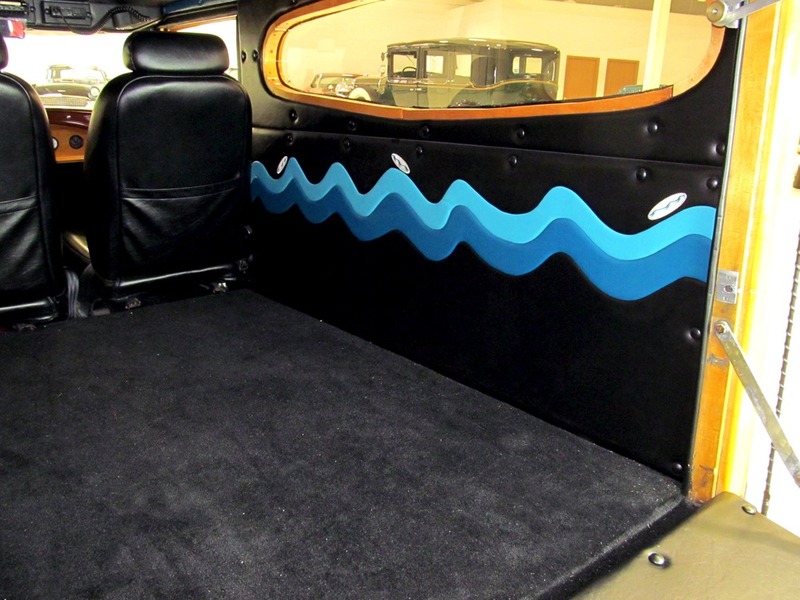 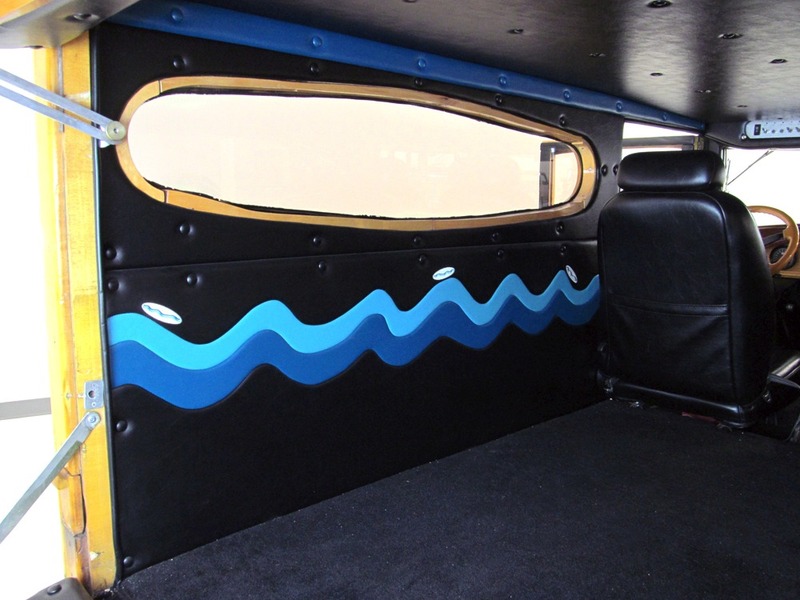 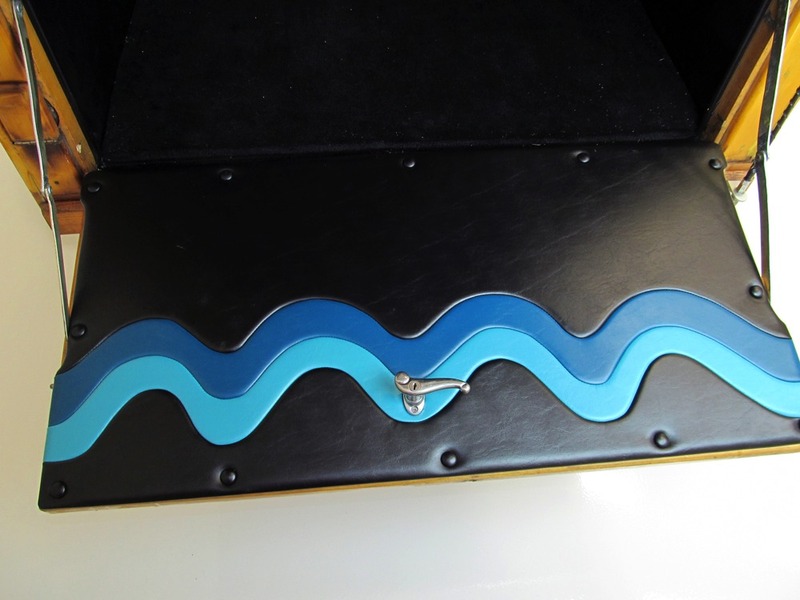 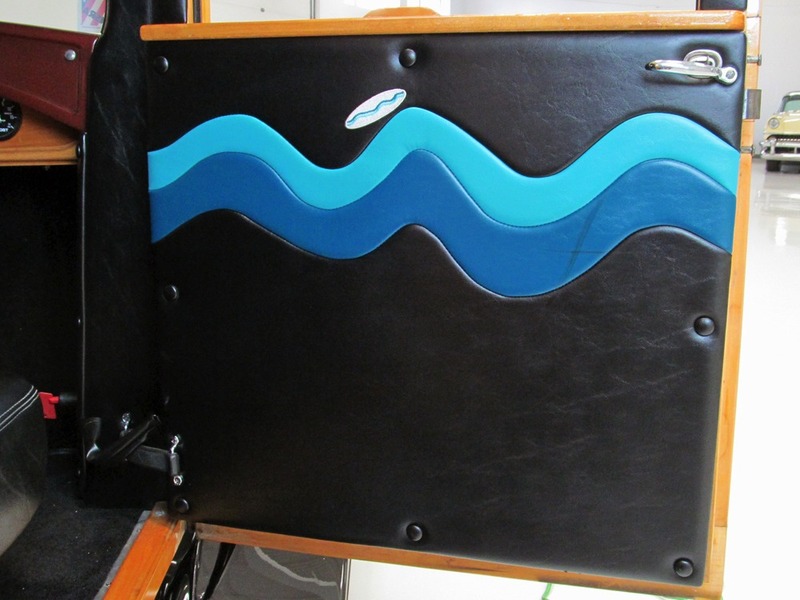 A tri-tone wave pattern runs through the door panels and into the rear cargo area, brightening things up and making it a little whimsical, which is how surf wagons should be. 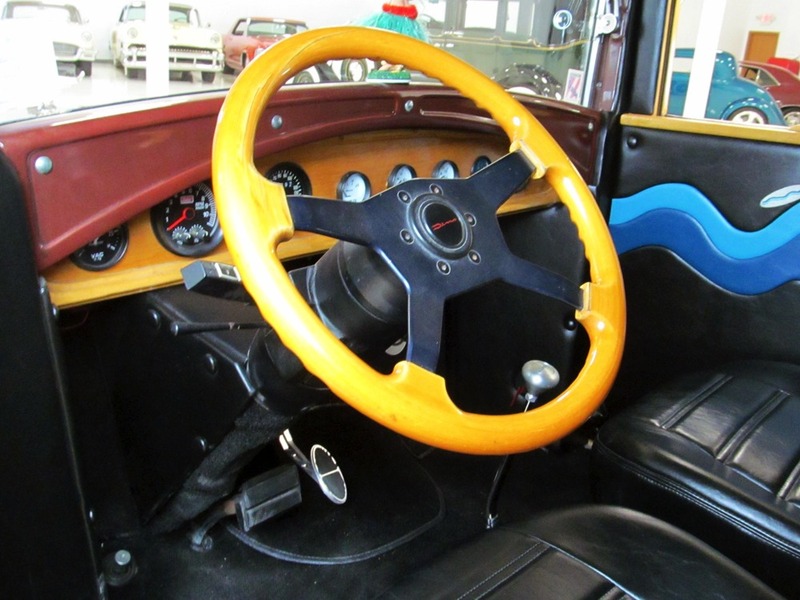 A wood-rimmed steering wheel lives atop a tilt steering column and a new Lokar shifter manages the C4 3-speed automatic transmission underneath. 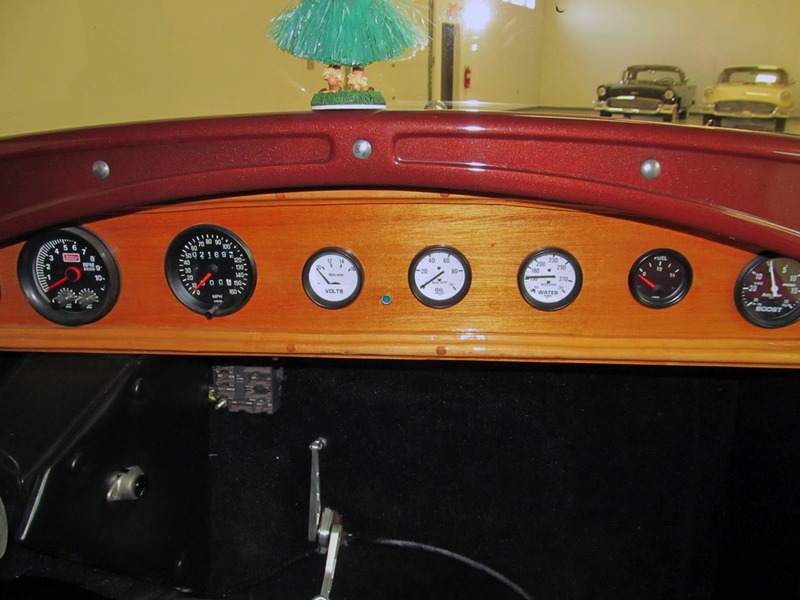 A matching wood instrument panel holds a full complement of instruments, some of them from the car’s original iteration, including a vintage Stewart-Warner speedometer and a boost gauge for the formerly supercharged engine. 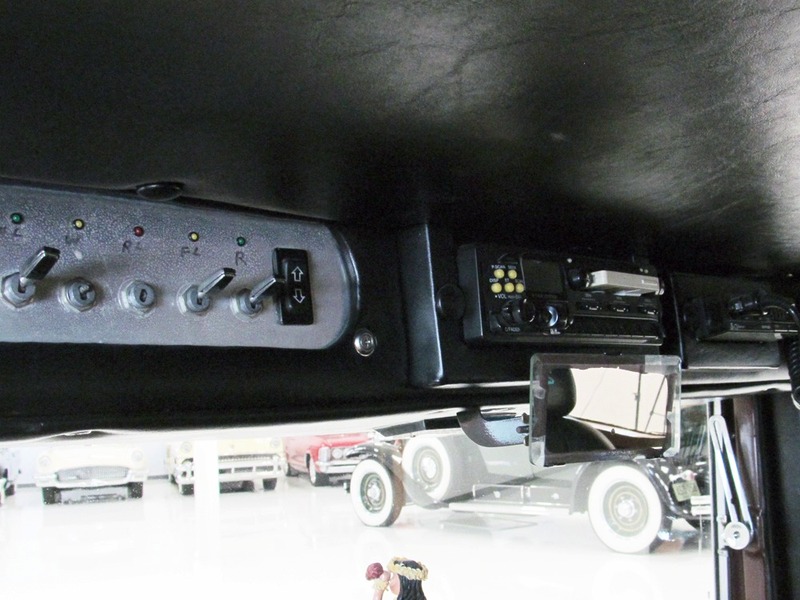 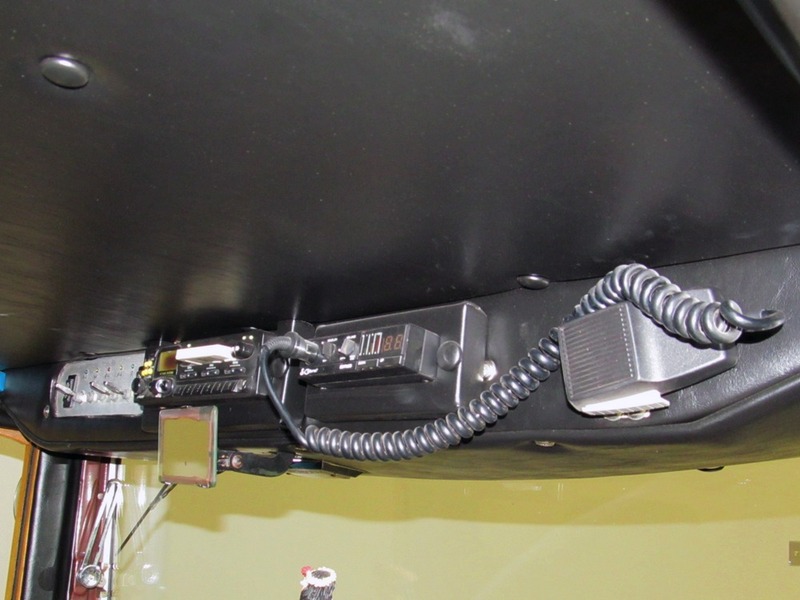 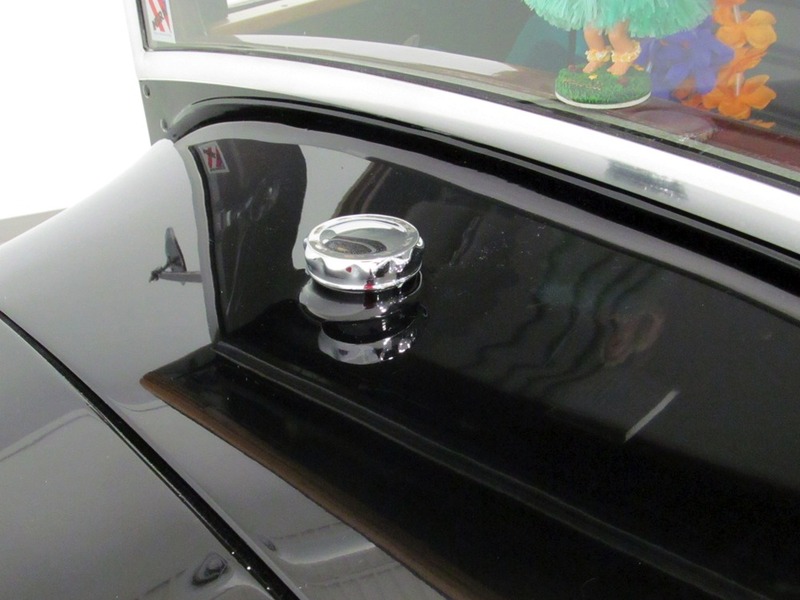 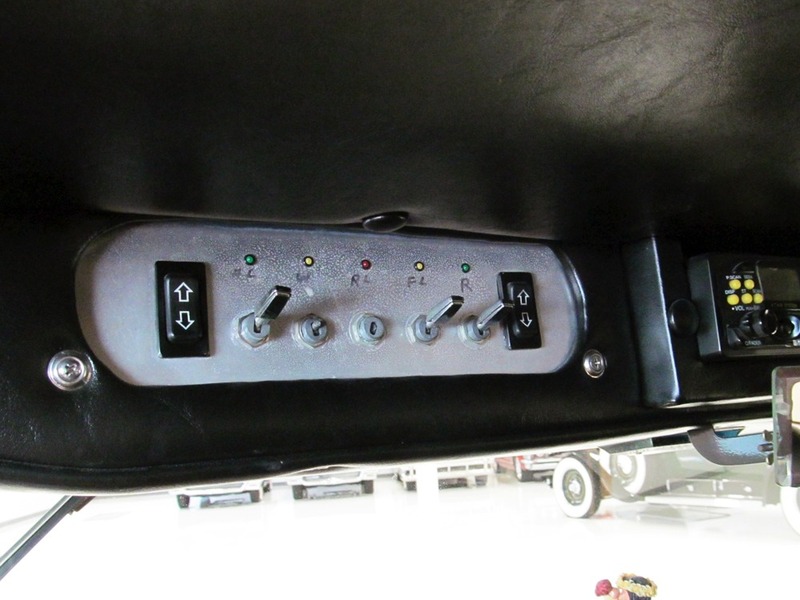 The overhead console holds switches for the power windows, headlights, wipers, and other systems, as well as an AM/FM/cassette stereo and a CB, which should give you an idea of the car’s era. 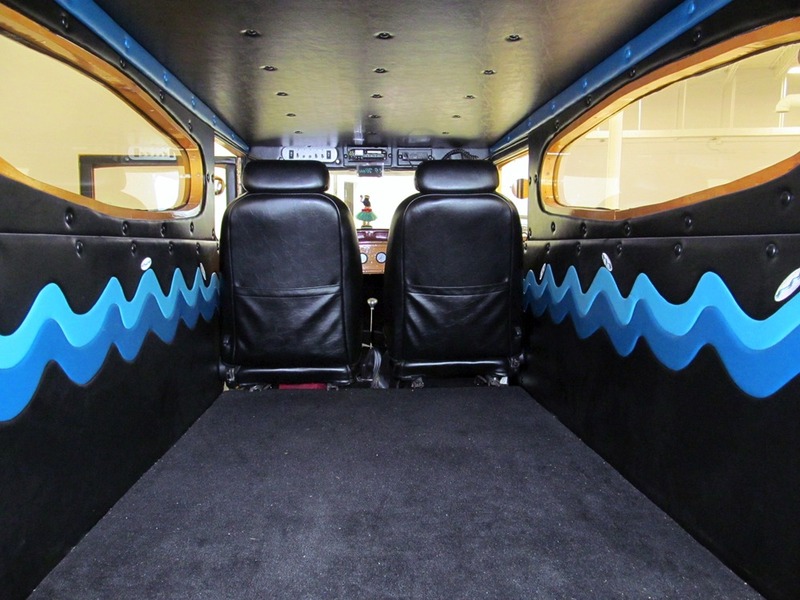 It’s all in excellent condition with no appreciable wear to the upholstery, and even the cargo area is nicely finished with black carpets and a button-tufted headliner. 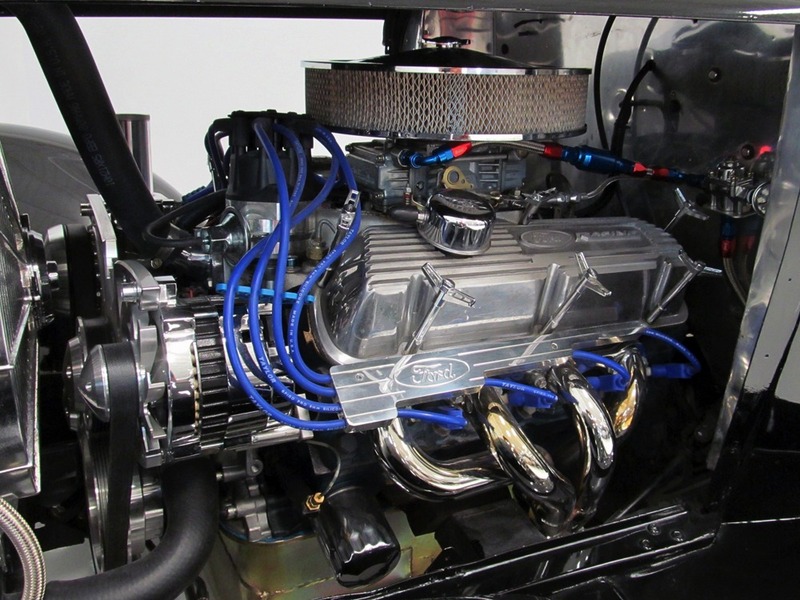 More recently, it has been mechanically freshened and the finicky supercharged engine was tossed in favor of a strong-running Ford 289 cubic inch V8 from a Fairlane. 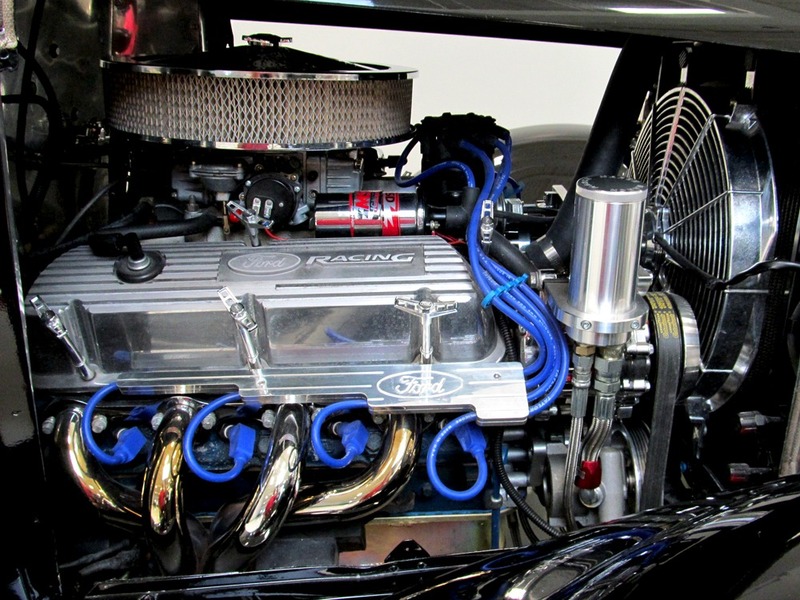 Rebuilt and snarling through a set of gorgeous chrome headers, it looks great and runs superbly. 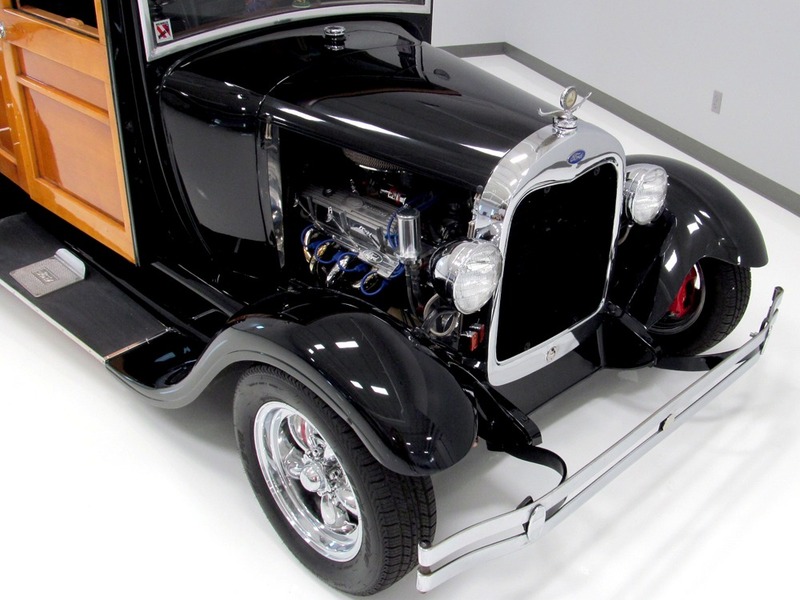 Admit it, not many of us run our rods to their potential, so reliability, comfort, and serviceability are equally as important, but this one remains quick around town and plenty torquey. 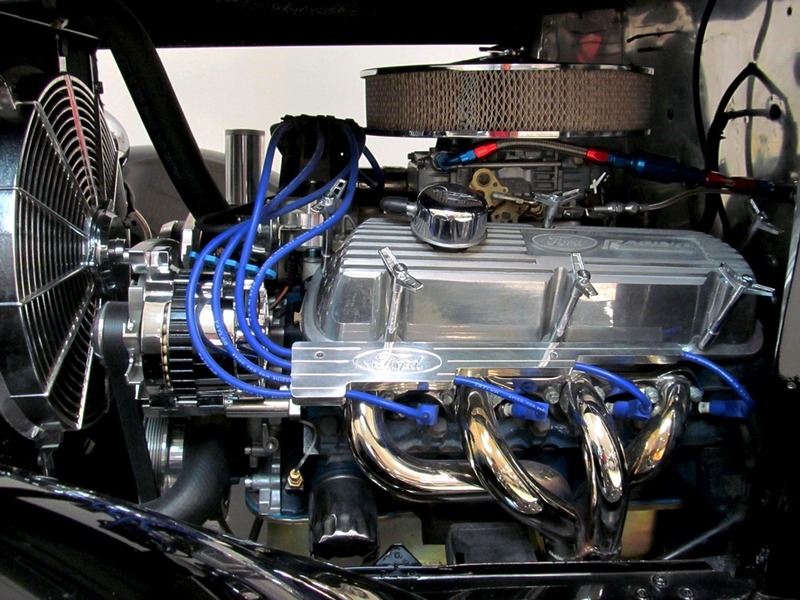 There’s a Holley double-pumper on top, lots of chrome and polished aluminum to show off with the open hood sides, and the sucker sounds amazing exhaling through a set of stainless mufflers with turn-downs just ahead of the rear axle. 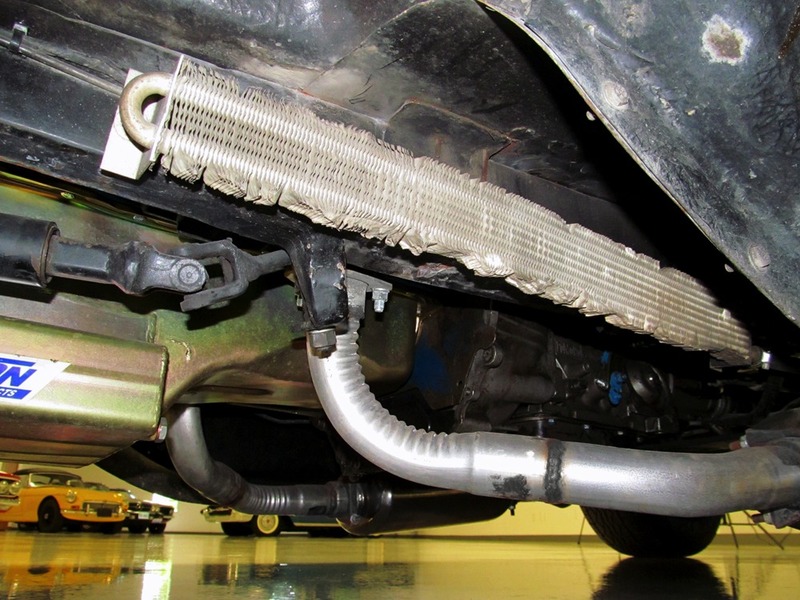 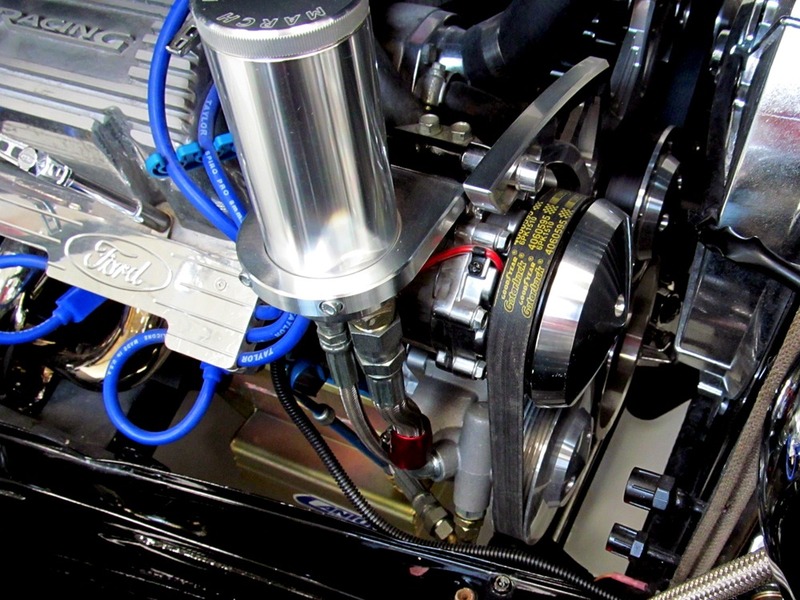 The serpentine belt drive is brand new and includes a big alternator, power steering pump, and A/C compressor, all in polished aluminum and chrome (the rest of the A/C system has not yet been installed but is included with the car). 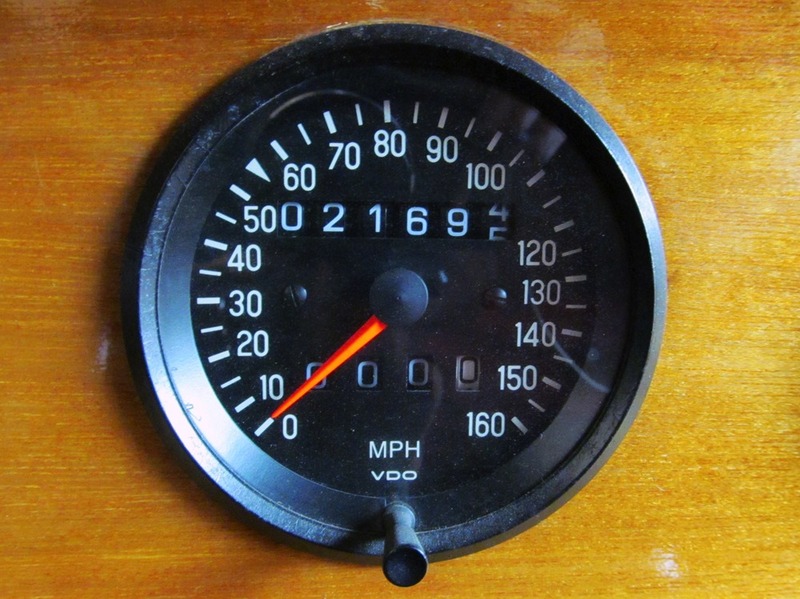 The C4 3-speed automatic always seems to be in the right gear and shifts crisply, and with a high-stall torque converter, it definitely has a lot of punch around town. 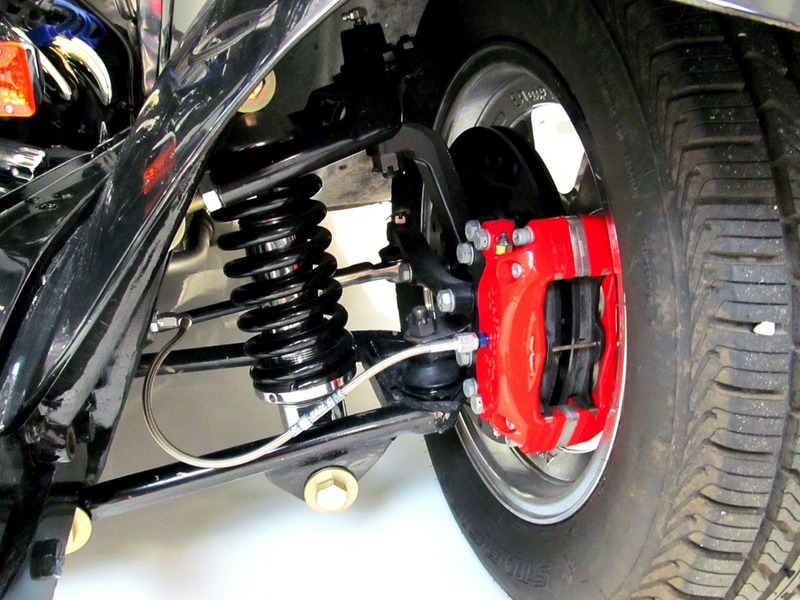 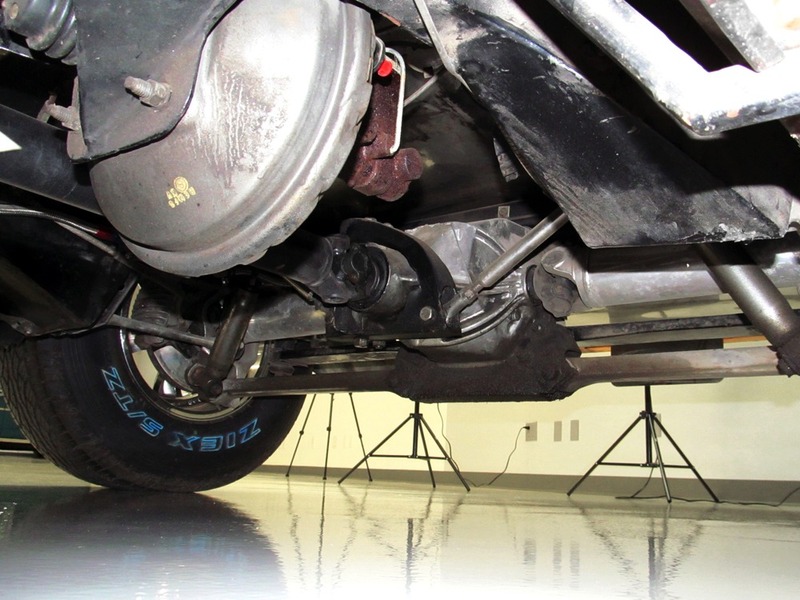 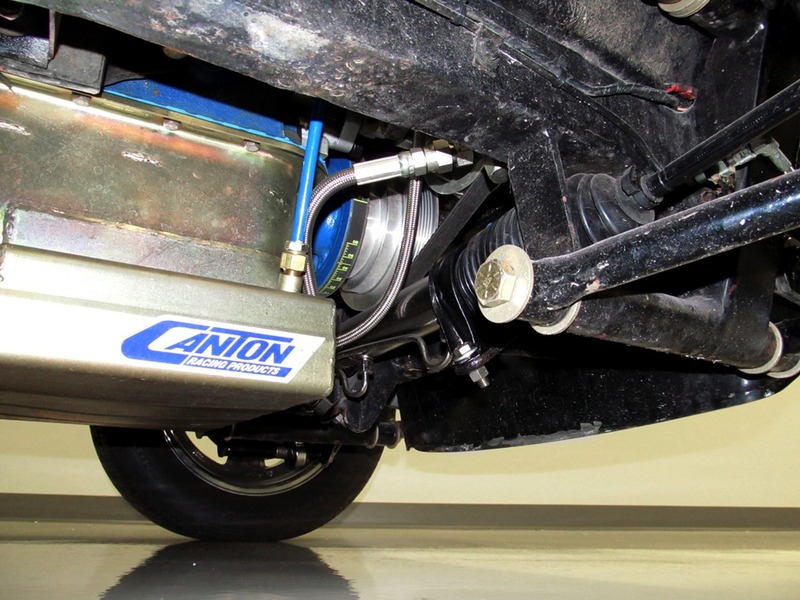 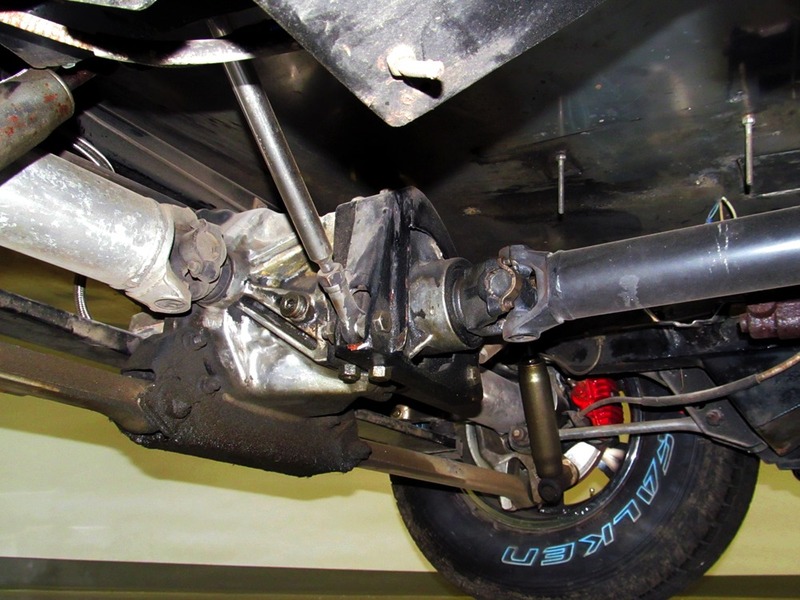 The front suspension is A-arms and coil-overs with power rack-and-pinion steering, so it’s effortless to handle even in tight parking lots, and out back there’s a fully independent setup from a C4 Corvette featuring a set of 3.42 gears in the pumpkin. 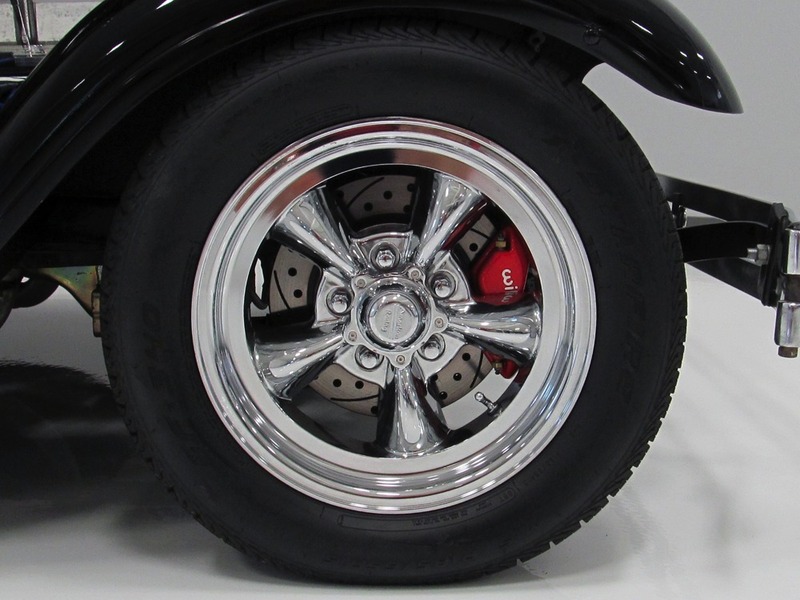 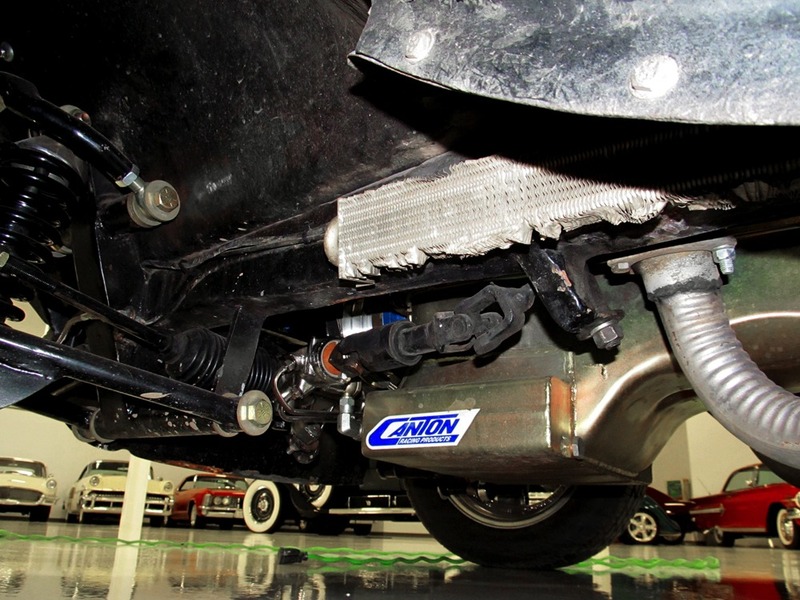 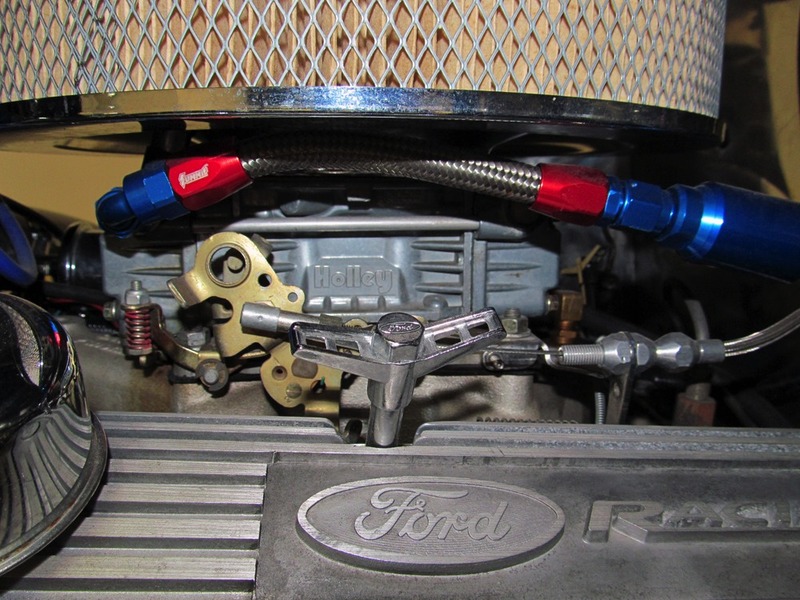 Wilwood vented and cross-drilled front discs are joined by Corvette rear discs to give this little Ford eyeball-bouncing stopping power. 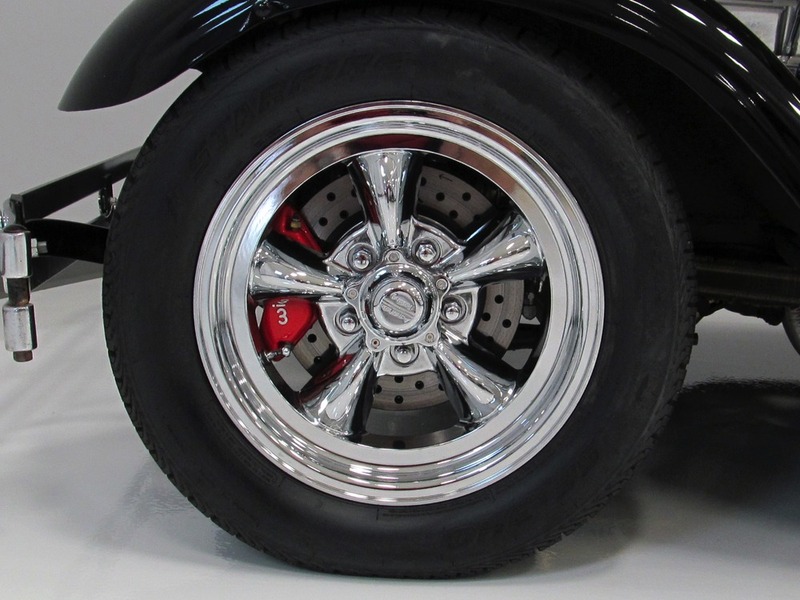 Brand new Torque Thrust wheels have been fitted and wear 185/65/15 front and fat 265/70/15 rear tires for an awesome stance. 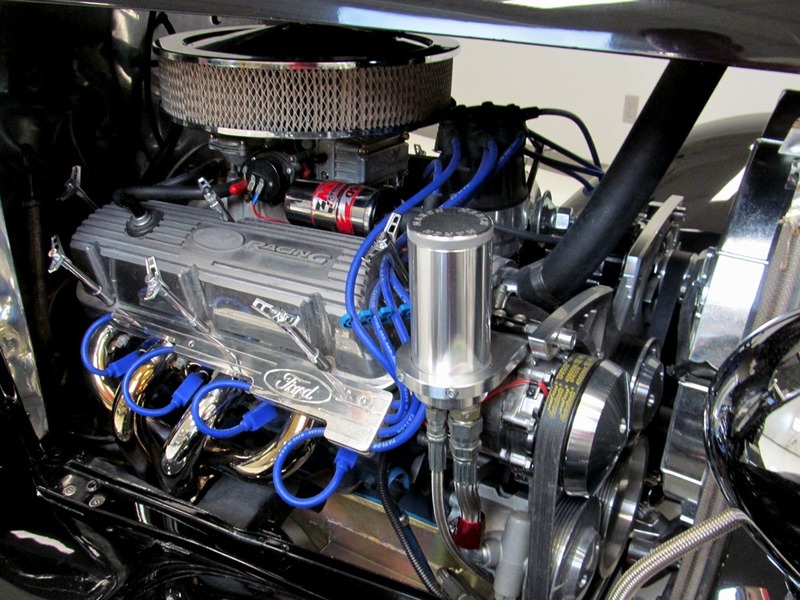 A very unusual and downright fast little Ford that has an awesome look and just wants to have fun. 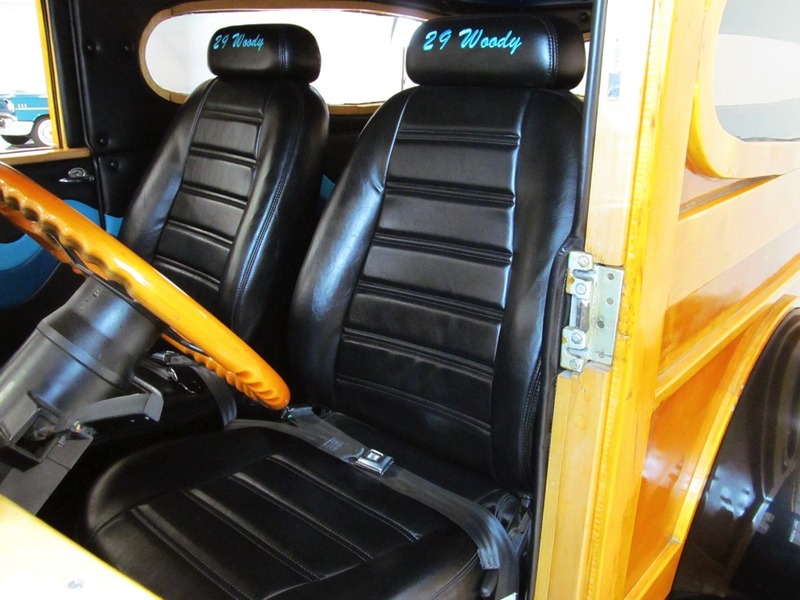 Offered for a fraction of the cost of the renovations, never mind actually duplicating something like this, it’s a sure-fire way to get all the attention at the next cruise night.